39mm platinum case, bezel set with 40 diamonds, dark mother of pearl dial, 8 round and 2 baguette diamond hour markers, Oyster 20mm bracelet. 39mm platinum case, bezel set with 40 diamonds, grey dial, 8 round and 2 baguette diamond hour markers, Oyster 20mm bracelet. 39mm platinum case, bezel set with 40 diamonds, glacier blue dial, 8 round and 2 baguette diamond hour markers, Oyster 20mm bracelet. 39mm platinum case, bezel set with 40 diamonds, glacier blue dial, Roman numerals, Oyster 20mm bracelet. 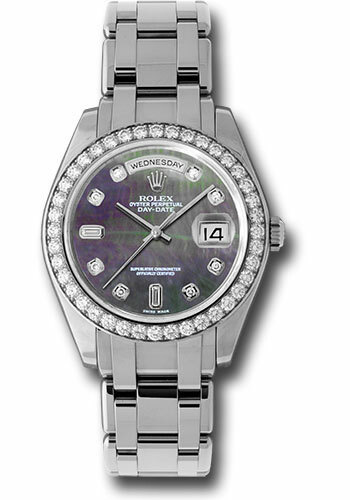 39mm platinum case, bezel set with 40 diamonds, diamond meteorite dial, Oyster 20mm bracelet. 39mm platinum case, bezel set with 42 baguette diamonds, diamond meteorite dial, Oyster 20mm bracelet set with 71 baguette diamonds.